Review of applications will begin on Oct 30, 2017. With two 8.4m mirrors on a common mount that can be combined to form an interferometer with an effective aperture of 23m, complemented with adaptive secondary mirrors, the Large Binocular Telescope (LBT) is the largest optical telescope in operation. 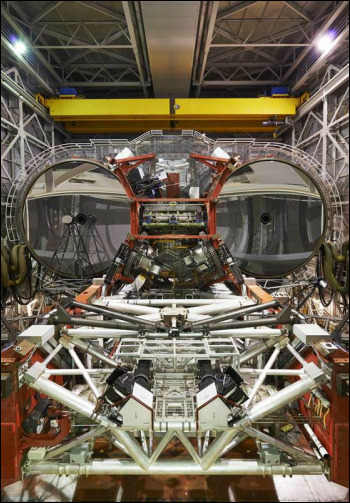 Providing unprecedented ground-based resolution at near- and mid-infrared wavelengths, the LBT is a forerunner of the Extremely Large Telescopes (ELTs). With a suite of state of the art instruments nearing completion, the observatory is moving to full operation while adding new capabilities such as ground-layer AO and new AO-fed instrumentation. The LBT Observatory is looking for a Program Manager (PM) who will lead the implementation of the Observatory development plan aimed at fully exploiting the unique capabilities of the telescope in the decade (at least) preceding the scientific exploitation of the current ELT projects. The PM will work closely with the Observatory Director and will be part of the Management Team in an Integrated Product Team environment. The PM will have a strong skill set in program and/or project management and the proven ability to coordinate teams in a highly technical and scientifically oriented environment. Experience or background in astronomy or the physical sciences is desired. The Program Manager (PM) will be, with the group managers, the enabler of the Director’s blueprint for the observatory. Cognizant of the priorities for the observatory set by the Director, the PM will work closely with the group managers who supervise the activities of the staff to achieve the goals of the observatory. coordinate and track projects and efforts (hereafter referred to as “the tasks”) that are strategic in nature (e.g. PP, long term developments), and/or span disciplines and groups, including summer shutdown activities. manage, in close collaboration with the Director, programmatic relationships with instrument teams and vendors. The PM reports to the Director and is a member of the Observatory Council (the Executive Committee dealing with high-level issues such as strategic planning, observatory policies, and personnel matters). The PM is Tucson-based, but is expected to spend time as needed at the LBT site (10,500 ft elevation) working with Mountain Management staff on operations. Occasional travel to the Partner institutions in the US and Europe, as well as professional conference attendance, is expected. The PM position does not entail direct staff supervision, except in the PM’s management role for specific projects.